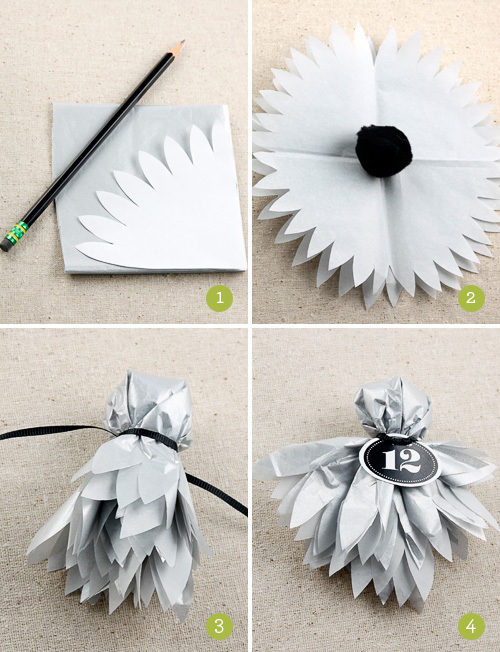 This craft started as a tissue paper dahlia (you can find the original craft and template at Martha Stewart Weddings), but turn it upside down and you have a ghost! I scaled the original template to 65% to make the ghost, and though I can’t include that template here for copyright reasons (don’t want Martha and her people coming after me! ), I have included a quarter circle template at the same size that you can download below. If you have pinking shears or decorative edging scissors, you can use those to create an interesting edge on the circle for your own ghost. 1. Download the tissue paper ghost template and print onto a sheet of regular printer paper. Cut out the template, and lay it on top of tissue paper (two sheets) that’s been folded into quarters. Line up the straight edges of the template with the corner of the paper, trace with a pencil, and cut the shape from the tissue paper. 2. Unfold the tissue paper, and insert a pom pom or cotton ball into the center. You can also use a piece of candy or a lollipop if you’d like the ghost to double as a Halloween treat. 3. 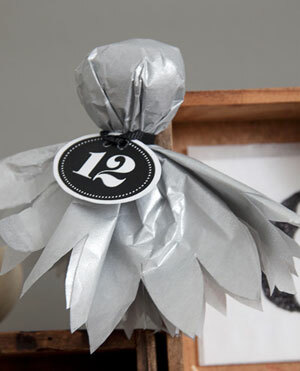 Wrap the tissue paper around the pom pom (or whatever you’re using for the head), and tie with a piece of 1/8″ ribbon. 4. Punch two holes into the top of the calendar number, and secure the number to the ghost with the ribbon.